One of the biggest news that yesterday hit the world of internet marketing is that Allen Says has sold his Warrior Forum to Freelancer.com, for an amount around 3.2 million of dollars. After 16 years, 730,000 users and an incredible number of WSO offers, now Warrior Forum is property of the famous freelancing website. Matt Barrie, chief executive of Freelancer.com, this morning has sent his personal message to the entire community, announcing the reduction of WSO launch price from $40 to $20, and that all War Room members will have their 20 year membership extended to lifetime, automatically, while new members can just pay $20 per year. Two good deals to start with a boost! There won’t be too many changes, even if Freelancer.com engineers will add many more functions, and probably they will remove something. We are all curious to see how the Warrior Forum section “Warriors for Hire” will do, now that one of the best freelancing websites of the world purchased it. And for the rest, we can just hope everything will be bright for the future of Warrior Forum. It’s sad to see Allen Says selling his creature after 16 years, and for many of us, Warrior Forum was a starting point. All my WSOs, except one, were launched just there, and just the last was launched on another network for the problems in setting up the OTOs with new WF method. So now there’s no other thing to do than preparing for a new explosive relaunch of the best internet marketing forum ever. Big news indeed, and it will be interesting to see how things pan out. Hi Luke, thanks for your comment! I think in the future, as soon as new changes will be made, some good sellers will come back to use Warrior Forum some more. The cut of $20 on the WSO launch price is yet good, because at the same price you paid before now you can list your WSO and bump it one more time, and that’s good. Even before this news I was planning on putting a product on there again. I think this may help people just starting with their own products. The cheaper listing price is more attractive and helps people take that first plunge. I remember my first listing you are so nervous about the entire process as well as what people will think of your product. Will just have to wait and see how this will pan out. Thanks Sue for your comment! It’s definitely a good idea to try using Warrior Forum once more, especially now that they cutted the price in half, and that it will get more traffic. 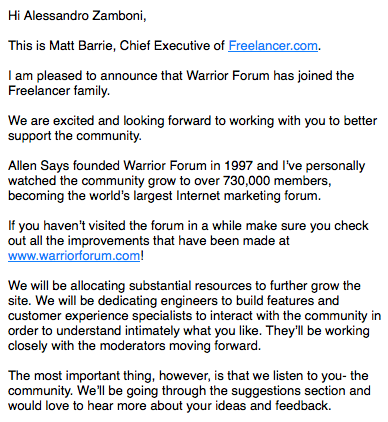 I hope this Allen Says move will be good enough to get the Warrior Forum back to its wonderful days. With any merger, there is always the good and the bad. One of my concerns is does this means double the promo emails my inbox will get from them now that they are together? What other surprises will there be from them in the future? Thanks Michel for your comment! Yes, when two companies merge, there are always problem, before or later. We have to hope that WF will live longer, coming back to its original charm. For the surprises, we will see! This is big news indeed. I’m not overly active at the WF, in fact, I’m almost non-existent there, but it will be interesting to see what other changes are made and how it goes. Hi Patti, thanks for your comment! Yes, a big news, definitely. And unexpected! About the amount paid, many people said is not comparable to the hours spent on WF by Allen Says. And it’s true what you say. We can just hope for the best!